When you have poor skin, it’s often an indicator of a deeper problem. The same can be said about hair. Its condition is also a visible sign of what’s going on within your body. 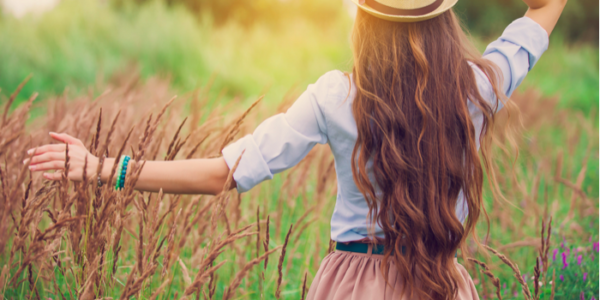 Factors like genetics, hormonal imbalance, lifestyle, and age affect hair health; therefore, achieving healthy hair and promoting hair growth has more to do with your internal health than the products you use. Shampoos, conditioners, and hair treatments can strengthen and revitalize your hair, but they won’t prevent hair loss, dandruff or increase growth as they may claim. To achieve genuinely healthy hair and prevent hair loss, you need to fulfill nutritional deficiencies that have been linked to poor hair health. Vitamin A is vital to cell growth, affecting everything from the body’s development to eyesight and immune function. And when it comes to the condition of your hair, vitamin A promotes sebum production which helps prevent hair strands from drying out. The pre-vitamin form of Vitamin A is beta-carotene which can be found in plant carotenoids found in vegetables such as carrots and dark orange fruits such as peaches, apricots, and cantaloupes. Anemia is caused by an iron deficiency, and one of its symptoms is hair loss. Because iron helps red blood cells carry oxygen to the cells, they are essential for all bodily function including hair growth. Foods rich in iron include spinach, lentils, sesame seeds, seaweed, and garbanzo beans. These foods are best consumed together with Vitamin C for better absorption of Iron. Vitamin C is crucial to the body because it aids in the absorption of iron from iron-rich foods. It also aids in the generation of collagen which helps strengthen the capillaries that supply the hair shafts with nutrients. The best sources of Vitamin C are strawberries, blackcurrants, blueberries, broccoli, papaya, and oranges. Vitamin C is also widely available in supplement form, but the supplement form does not supply all forms of vitamin C; therefore, it is best taken through food sources. Our bodies produce all the fatty acids it needs except two: linoleic acid (LA), an omega-6 fatty acid, and alpha-linolenic acid (ALA), an omega-3 fatty acid. Zinc is a vital mineral not just for healthy hair but also for skin and nails. It plays a crucial role in hair tissue growth and keeps the oil glands around the follicles working well. Foods that are rich in zinc include wheat germ, spinach, and pumpkin seeds. I also recommend taking the flavonoid Quercetin to support hair health and growth. Flavonoids give plants their color and help protect them against organisms that can cause disease. Flavonoids are potent antioxidants, anti-inflammatory, and anti-bacterial agents. Therefore they are excellent for treating a wide range of conditions. Quercetin may also be useful for the prevention of heart disease1,2,3. But getting back to hair, evidence shows a firm link between heart disease and pattern hair loss. One study found that men who go bald before age 45 at the crown were 36% more prone to suffer from a cardiac event. Foods rich in quercetin include onions, capers, apples, broccoli, kale, cranberry, and sweet potato. Although health for hair comes from within, there are times when a topical solution is a great addition to change of diet. To get rid of dandruff, you may either mix equal parts of apple cider vinegar and comb into the hair and leave it in for 15 minutes before shampooing twice per week, or use bentonite clay. Please also see my article on alopecia and hair loss here. J Cosmet Dermatol. 2015 Mar;14(1):76-82. doi: 10.1111/jocd.12127. Epub 2015 Jan 8.